6 Luxyline "hex" valve caps	Shaped out of a single block, in an stainless aluminum alloy, these valve caps can not rust or tarnish over time (unlike some poor quality caps that oxidize and stick onto the valve). We recommend you to lubricate the valve before fixing them, to make it easier to remove if necessary.These valve caps can be fitted on all wheel rims of cars, motorcycles, scooters, quads, trikes... They contain a seal for optimum protection of the valve and to maintain proper tire pressure. Logos are supplied separately, you will have to stick them before assembly.Additional valve caps can be added for an extra 1€ per cap (there will be no extra cost on shipping), please contact us. 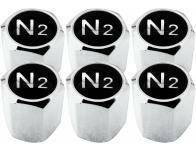 6 Nitrogen N2 black & chrome "hex" valve caps	Shaped out of a single block, in an stainless aluminum alloy, these valve caps can not rust or tarnish over time (unlike some poor quality caps that oxidize and stick onto the valve). We recommend you to lubricate the valve before fixing them, to make it easier to remove if necessary.These valve caps can be fitted on all wheel rims of cars, motorcycles, scooters, quads, trikes... They contain a seal for optimum protection of the valve and to maintain proper tire pressure. Logos are supplied separately, you will have to stick them before assembly.Additional valve caps can be added for an extra 1€ per cap (there will be no extra cost on shipping), please contact us. 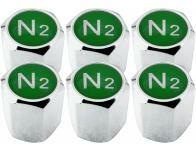 6 Nitrogen N2 green "hex" valve caps	Shaped out of a single block, in an stainless aluminum alloy, these valve caps can not rust or tarnish over time (unlike some poor quality caps that oxidize and stick onto the valve). We recommend you to lubricate the valve before fixing them, to make it easier to remove if necessary.These valve caps can be fitted on all wheel rims of cars, motorcycles, scooters, quads, trikes... They contain a seal for optimum protection of the valve and to maintain proper tire pressure. Logos are supplied separately, you will have to stick them before assembly.Additional valve caps can be added for an extra 1€ per cap (there will be no extra cost on shipping), please contact us. 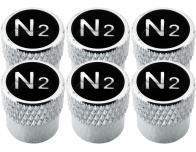 6 Nitrogen N2 black & chrome "striated" valve caps	Shaped out of a single block, in an stainless aluminum alloy, these valve caps can not rust or tarnish over time (unlike some poor quality caps that oxidize and stick onto the valve). We recommend you to lubricate the valve before fixing them, to make it easier to remove if necessary.These valve caps can be fitted on all wheel rims of cars, motorcycles, scooters, quads, trikes... 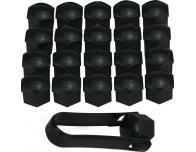 They contain a seal for optimum protection of the valve and to maintain proper tire pressure. Logos are supplied separately, you will have to stick them before assembly.Additional valve caps can be added for an extra 1€ per cap (there will be no extra cost on shipping), please contact us. 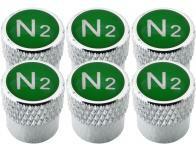 6 Nitrogen N2 green "striated" valve caps	Shaped out of a single block, in an stainless aluminum alloy, these valve caps can not rust or tarnish over time (unlike some poor quality caps that oxidize and stick onto the valve). We recommend you to lubricate the valve before fixing them, to make it easier to remove if necessary.These valve caps can be fitted on all wheel rims of cars, motorcycles, scooters, quads, trikes... 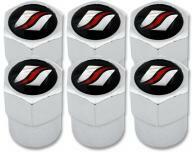 They contain a seal for optimum protection of the valve and to maintain proper tire pressure. Logos are supplied separately, you will have to stick them before assembly.Additional valve caps can be added for an extra 1€ per cap (there will be no extra cost on shipping), please contact us. 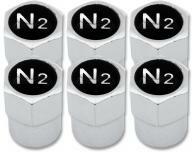 6 Nitrogen N2 black & chrome plastic valve caps	Made of plastic and coated with a layer of chrome, these valve caps can not rust or tarnish over time (unlike some poor quality caps that oxidize and stick to the valve).Extra valve caps can be added at £0.80 per plug (there will be no extra shipping fee), please contact us to order some more.These valve caps can be fitted on all wheel rims of cars, motorcycles, scooters, quads, trikes... 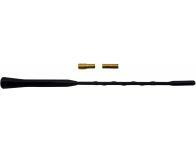 They contain a seal for optimum protection of the valve and to maintain proper tire pressure. Logos are supplied separately, you will have to stick them before assembly. 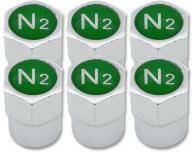 6 Nitrogen N2 green plastic valve caps	Made of plastic and coated with a layer of chrome, these valve caps can not rust or tarnish over time (unlike some poor quality caps that oxidize and stick to the valve).Extra valve caps can be added at £0.80 per plug (there will be no extra shipping fee), please contact us to order some more.These valve caps can be fitted on all wheel rims of cars, motorcycles, scooters, quads, trikes... 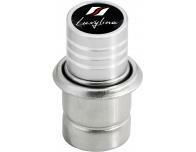 They contain a seal for optimum protection of the valve and to maintain proper tire pressure. Logos are supplied separately, you will have to stick them before assembly. 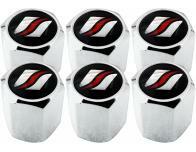 6 Luxyline "striated" valve caps	Shaped out of a single block, in an stainless aluminum alloy, these valve caps can not rust or tarnish over time (unlike some poor quality caps that oxidize and stick onto the valve). We recommend you to lubricate the valve before fixing them, to make it easier to remove if necessary.These valve caps can be fitted on all wheel rims of cars, motorcycles, scooters, quads, trikes... 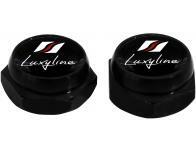 They contain a seal for optimum protection of the valve and to maintain proper tire pressure. Logos are supplied separately, you will have to stick them before assembly.Additional valve caps can be added for an extra 1€ per cap (there will be no extra cost on shipping), please contact us. 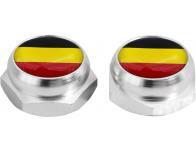 Cigarette lighter Germany German flag black	This cigarette lighter made in steel and aluminum will replace your original one to add an extra finishing detail inside your car. The brand logo is supplied separately, simply peel off the protection from the adhesive and stick it to the cigarette lighter.Please check the size of your original lighter for compatibility (diameter and length of the plug). 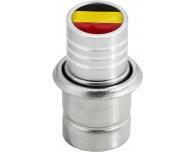 Cigarette lighter Germany German flag	This cigarette lighter made in steel and aluminum will replace your original one to add an extra finishing detail inside your car. The brand logo is supplied separately, simply peel off the protection from the adhesive and stick it to the cigarette lighter.Please check the size of your original lighter for compatibility (diameter and length of the plug). 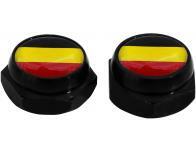 Rivet-Covers for Licence Plate Germany German flag (black)	This Aluminium Rivets + Rivet-Covers Kit for licence plates will replace the rivets usually used. With this kit, your license plate will be attached with 2 rivets, and finished with the brand logo.You can complete your order with our rivet gun if you do not own one. Rivet-Covers for Licence Plate Germany German flag (silver)	This Aluminium Rivets + Rivet-Covers Kit for licence plates will replace the rivets usually used. With this kit, your license plate will be attached with 2 rivets, and finished with the brand logo.You can complete your order with our rivet gun if you do not own one. 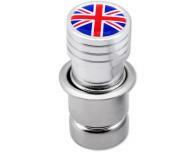 Cigarette lighter English Flag UK England British Union Jack "long"	This cigarette lighter made in steel and aluminum will replace your original one to add an extra finishing detail inside your car. The brand logo is supplied separately, simply peel off the protection from the adhesive and stick it to the cigarette lighter.Please check the size of your original lighter for compatibility (diameter and length of the plug). 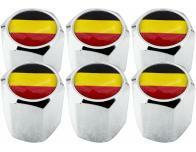 6 Belgium flag "hex" valve caps	Shaped out of a single block, in an stainless aluminum alloy, these valve caps can not rust or tarnish over time (unlike some poor quality caps that oxidize and stick onto the valve). We recommend you to lubricate the valve before fixing them, to make it easier to remove if necessary.These valve caps can be fitted on all wheel rims of cars, motorcycles, scooters, quads, trikes... 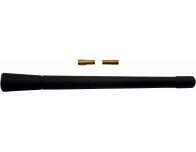 They contain a seal for optimum protection of the valve and to maintain proper tire pressure. Logos are supplied separately, you will have to stick them before assembly.Additional valve caps can be added for an extra 1€ per cap (there will be no extra cost on shipping), please contact us. 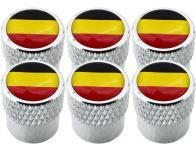 6 Belgium flag "striated" valve caps	Shaped out of a single block, in an stainless aluminum alloy, these valve caps can not rust or tarnish over time (unlike some poor quality caps that oxidize and stick onto the valve). We recommend you to lubricate the valve before fixing them, to make it easier to remove if necessary.These valve caps can be fitted on all wheel rims of cars, motorcycles, scooters, quads, trikes... They contain a seal for optimum protection of the valve and to maintain proper tire pressure. Logos are supplied separately, you will have to stick them before assembly.Additional valve caps can be added for an extra 1€ per cap (there will be no extra cost on shipping), please contact us. 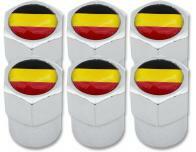 6 Belgium flag plastic valve caps	Made of plastic and coated with a layer of chrome, these valve caps can not rust or tarnish over time (unlike some poor quality caps that oxidize and stick to the valve).Extra valve caps can be added at £0.80 per plug (there will be no extra shipping fee), please contact us to order some more.These valve caps can be fitted on all wheel rims of cars, motorcycles, scooters, quads, trikes... 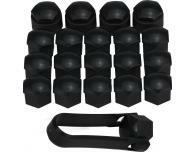 They contain a seal for optimum protection of the valve and to maintain proper tire pressure. Logos are supplied separately, you will have to stick them before assembly. 6 Luxyline plastic valve caps	Made of plastic and coated with a layer of chrome, these valve caps can not rust or tarnish over time (unlike some poor quality caps that oxidize and stick to the valve).Extra valve caps can be added at £0.80 per plug (there will be no extra shipping fee), please contact us to order some more.These valve caps can be fitted on all wheel rims of cars, motorcycles, scooters, quads, trikes... They contain a seal for optimum protection of the valve and to maintain proper tire pressure. Logos are supplied separately, you will have to stick them before assembly. Rivet-Covers for Licence Plate Luxyline (black)	This Aluminium Rivets + Rivet-Covers Kit for licence plates will replace the rivets usually used. With this kit, your license plate will be attached with 2 rivets, and finished with the brand logo.You can complete your order with our rivet gun if you do not own one. 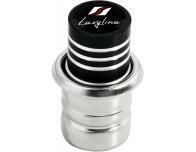 Cigarette lighter Luxyline black	This cigarette lighter made in steel and aluminum will replace your original one to add an extra finishing detail inside your car. The brand logo is supplied separately, simply peel off the protection from the adhesive and stick it to the cigarette lighter.Please check the size of your original lighter for compatibility (diameter and length of the plug). 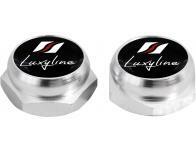 Cigarette lighter Luxyline	This cigarette lighter made in steel and aluminum will replace your original one to add an extra finishing detail inside your car. The brand logo is supplied separately, simply peel off the protection from the adhesive and stick it to the cigarette lighter.Please check the size of your original lighter for compatibility (diameter and length of the plug). Rivet-Covers for Licence Plate Luxyline (silver)	This Aluminium Rivets + Rivet-Covers Kit for licence plates will replace the rivets usually used. With this kit, your license plate will be attached with 2 rivets, and finished with the brand logo.You can complete your order with our rivet gun if you do not own one. Wheel bolt caps 17mm black	Set of 20 wheel bolt caps, which add the finishing that is always missing on car rims, by covering the bolt head often oxidized and blackened with a curved chromed surface. Please check the width of the nuts.Your nuts will also be protected from water, salt and solvents present on the road. Wheel bolt caps 19mm black	Set of 20 wheel bolt caps, which add the finishing that is always missing on car rims, by covering the bolt head often oxidized and blackened with a curved chromed surface. Please check the width of the nuts.Your nuts will also be protected from water, salt and solvents present on the road. 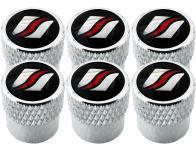 Wheel bolt caps 17mm chrome	Set of 20 wheel bolt caps, which add the finishing that is always missing on car rims, by covering the bolt head often oxidized and blackened with a curved chromed surface. Please check the width of the nuts.Your nuts will also be protected from water, salt and solvents present on the road. Short rubber antenna	The original antennas are often just straight antennas, too long ones and not always suitable for the car's line. We suggest changing the antenna with a short version, which will be much more discreet and elegant.The reception will be as good as with your original antenna (AM and FM). 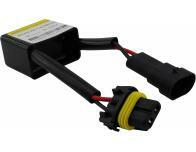 Two adapters are supplied, M5 and M6, to allow installation on most cars on the market. Short Original Type Antenna	The original antennas are often just straight antennas, too long ones and not always suitable for the car's line. We suggest changing the antenna with a short version, which will be much more discreet and elegant.The reception will be as good as with your original antenna (AM and FM). 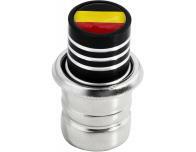 Two adapters are supplied, M5 and M6, to allow installation on most cars on the market. Long Rubber Antenna	The original antennas are often just straight antennas, too long ones and not always suitable for the car's line. We suggest changing the antenna with a short version, which will be much more discreet and elegant.The reception will be as good as with your original antenna (AM and FM). 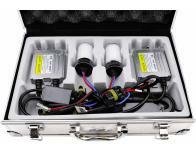 Two adapters are supplied, M5 and M6, to allow installation on most cars on the market. Wheel bolt caps anti-theft 17mm black	Contains 4 anti-theft valve capsSet of 20 wheel bolt caps, which add the finishing that is always missing on car rims, by covering the bolt head often oxidized and blackened with a curved chromed surface. Please check the width of the nuts.Your nuts will also be protected from water, salt and solvents present on the road. 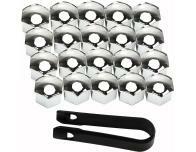 Wheel bolt caps anti-theft 17mm chrome	Contains 4 anti-theft valve capsSet of 20 wheel bolt caps, which add the finishing that is always missing on car rims, by covering the bolt head often oxidized and blackened with a curved chromed surface. Please check the width of the nuts.Your nuts will also be protected from water, salt and solvents present on the road. 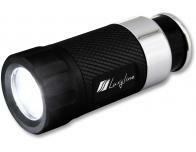 LED flashlight, rechargeable on the cigarette lighter black	This LED flashlight should always be in your car! 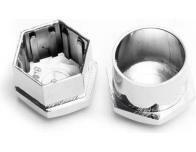 Permanently connected to your cigarette lighter socket, it will always be ready for use. The aluminum and stainless steel housing is watertight.A red light indicates that the lamp is charging (this indicator can be disabled by turning the knob halfway between the position ON and OFF). Equipped with a Ni-MH battery with overload protection. 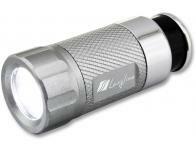 LED flashlight, rechargeable on the cigarette lighter silver gray	This LED flashlight should always be in your car! Permanently connected to your cigarette lighter socket, it will always be ready for use. The aluminum and stainless steel housing is watertight.A red light indicates that the lamp is charging (this indicator can be disabled by turning the knob halfway between the position ON and OFF). Equipped with a Ni-MH battery with overload protection. 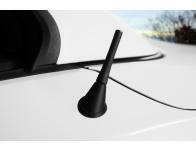 GPS Shark Fin Antenna	Warning, this product is not compatible with the Peugeot 208 with a glossy black antenna base (however with the matte black base it is compatible)The original antennas are often just straight antennas, too long ones and not always suitable for the car's line. We suggest changing the antenna with a short version, which will be much more discreet and elegant.The reception will be as good as with your original antenna (AM and FM). 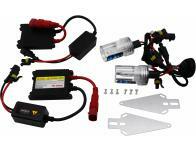 Two adapters are supplied, M5 and M6, to allow installation on most cars on the market. Leather gearshift lever knob	This black leather gearshift knob will particularly enhance the inside of your car with its sporty and luxurious appearance. It is in genuine matte black leather with red stitching and chrome inserts.Mounting the gearshift knob is easy and does not require any special tools, it fits on most cars. Supplied with a key and several adapters allowing you to fix it on different diameters (17, 12, 11 et 10mm).CAUTION: Does not fit on cars with a ring on the reverse gear (or you will have to make some changes). 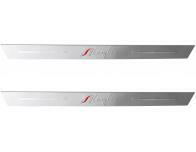 Trunk chrome trim Audi A4 série 1 avant 94-98/série 2 00-04 A6 A8 Q2 R8 RS4 RS6 S4 S5 S6 TT... 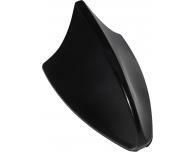 This boot chrome strip fits to the lower edge of the boot lid/hatch of your car, to add chrome finish. It will make a stylish addition to the entire rear bumper of the vehicle by highlighting it with a touch of chromium.Warning: this is a roll of Universal chrome strip to be cut/adjusted by yourself. The product is specially designed so it can be trimmed very easily, which gives a perfect and specific finish to your vehicle. You can cut the strips using a pair of scissors (mounting is not difficult, and does not require knowledge/special tools).The back of the chrome strip is covered with a 3M double-sided tape (premium adhesive, long lasting and sticks on all surfaces). Is resistant to rain/snow, UV and washing (indirect high pressure jet and rollers).Make sure you degrease the surface with a Gasoline type F solvent before applying it. Side windows chrome trim 9mm x 2.5m	This chrome window strip fits on the edges of the side windows of the car, to add chrome finish. It will enhance the length of the vehicle by highlighting it with a touch of chrome.Warning: this is a roll of Universal chrome strip to be cut/adjusted by yourself. The product is specially designed so it can be trimmed very easily, which gives a perfect and specific finish to your vehicle. You can cut the strips using a pair of scissors (mounting is not difficult, and does not require knowledge/special tools).The back of the chrome strip is covered with a 3M double-sided tape (premium adhesive, long lasting and sticks on all surfaces). Is resistant to rain/snow, UV and washing (indirect high pressure jet and rollers).Make sure you degrease the surface with a Gasoline type F solvent before applying it. Side windows chrome trim 12mm x 2.5m	This chrome window strip fits on the edges of the side windows of the car, to add chrome finish. It will enhance the length of the vehicle by highlighting it with a touch of chrome.Warning: this is a roll of Universal chrome strip to be cut/adjusted by yourself. The product is specially designed so it can be trimmed very easily, which gives a perfect and specific finish to your vehicle. You can cut the strips using a pair of scissors (mounting is not difficult, and does not require knowledge/special tools).The back of the chrome strip is covered with a 3M double-sided tape (premium adhesive, long lasting and sticks on all surfaces). Is resistant to rain/snow, UV and washing (indirect high pressure jet and rollers).Make sure you degrease the surface with a Gasoline type F solvent before applying it. Side windows chrome trim 15mm x 2.5m	This chrome window strip fits on the edges of the side windows of the car, to add chrome finish. It will enhance the length of the vehicle by highlighting it with a touch of chrome.Warning: this is a roll of Universal chrome strip to be cut/adjusted by yourself. The product is specially designed so it can be trimmed very easily, which gives a perfect and specific finish to your vehicle. You can cut the strips using a pair of scissors (mounting is not difficult, and does not require knowledge/special tools).The back of the chrome strip is covered with a 3M double-sided tape (premium adhesive, long lasting and sticks on all surfaces). Is resistant to rain/snow, UV and washing (indirect high pressure jet and rollers).Make sure you degrease the surface with a Gasoline type F solvent before applying it. Side windows chrome trim 21mm x 2.5m	This chrome window strip fits on the edges of the side windows of the car, to add chrome finish. It will enhance the length of the vehicle by highlighting it with a touch of chrome.Warning: this is a roll of Universal chrome strip to be cut/adjusted by yourself. The product is specially designed so it can be trimmed very easily, which gives a perfect and specific finish to your vehicle. You can cut the strips using a pair of scissors (mounting is not difficult, and does not require knowledge/special tools).The back of the chrome strip is covered with a 3M double-sided tape (premium adhesive, long lasting and sticks on all surfaces). Is resistant to rain/snow, UV and washing (indirect high pressure jet and rollers).Make sure you degrease the surface with a Gasoline type F solvent before applying it. Painting kit for brake calipers red	Complete kit to paint your 4 brake calipers (shoes or drums). Very easy to use, this kit will allow you to cover your brake calipers with ultra resistant paint (against solvents, grease, salt, etc. ), and will prevent oxidation of your brake shoes. Maintenance is facilitated because the surface will be permanently smooth, therefore holding less dirt. You will get the same sports effects that can be found on the brake shoes of high-end and sports cars. (Porsche, Subaru, Brembo, etc. )The kit consists of a cleaner spray, a paint, and a hardener. Paint will be made using a brush, to provide much thicker and stronger paint than what is usually obtained with sprays sold on the current market. In addition, the amount of paint supplied is sufficient for 2 coats (or 3 if done carefully). A documentation on how to apply it is provided. It is not necessary to remove your brake calipers.WARNING: The cleaner will be removed from package for all deliveries outside metropolitan France (air safety regulations).Brush and spatula come with the kit. Painting kit for brake calipers blue	Complete kit to paint your 4 brake calipers (shoes or drums). Very easy to use, this kit will allow you to cover your brake calipers with ultra resistant paint (against solvents, grease, salt, etc. ), and will prevent oxidation of your brake shoes. Maintenance is facilitated because the surface will be permanently smooth, therefore holding less dirt. You will get the same sports effects that can be found on the brake shoes of high-end and sports cars. (Porsche, Subaru, Brembo, etc. )The kit consists of a cleaner spray, a paint, and a hardener. Paint will be made using a brush, to provide much thicker and stronger paint than what is usually obtained with sprays sold on the current market. In addition, the amount of paint supplied is sufficient for 2 coats (or 3 if done carefully). A documentation on how to apply it is provided. It is not necessary to remove your brake calipers.WARNING: The cleaner will be removed from package for all deliveries outside metropolitan France (air safety regulations).Brush and spatula come with the kit. Painting kit for brake calipers yellow	Complete kit to paint your 4 brake calipers (shoes or drums). Very easy to use, this kit will allow you to cover your brake calipers with ultra resistant paint (against solvents, grease, salt, etc. ), and will prevent oxidation of your brake shoes. Maintenance is facilitated because the surface will be permanently smooth, therefore holding less dirt. You will get the same sports effects that can be found on the brake shoes of high-end and sports cars. (Porsche, Subaru, Brembo, etc. )The kit consists of a cleaner spray, a paint, and a hardener. Paint will be made using a brush, to provide much thicker and stronger paint than what is usually obtained with sprays sold on the current market. In addition, the amount of paint supplied is sufficient for 2 coats (or 3 if done carefully). A documentation on how to apply it is provided. It is not necessary to remove your brake calipers.WARNING: The cleaner will be removed from package for all deliveries outside metropolitan France (air safety regulations).Brush and spatula come with the kit. Painting kit for brake calipers black	Complete kit to paint your 4 brake calipers (shoes or drums). Very easy to use, this kit will allow you to cover your brake calipers with ultra resistant paint (against solvents, grease, salt, etc. ), and will prevent oxidation of your brake shoes. Maintenance is facilitated because the surface will be permanently smooth, therefore holding less dirt. You will get the same sports effects that can be found on the brake shoes of high-end and sports cars. (Porsche, Subaru, Brembo, etc. )The kit consists of a cleaner spray, a paint, and a hardener. Paint will be made using a brush, to provide much thicker and stronger paint than what is usually obtained with sprays sold on the current market. In addition, the amount of paint supplied is sufficient for 2 coats (or 3 if done carefully). A documentation on how to apply it is provided. It is not necessary to remove your brake calipers.WARNING: The cleaner will be removed from package for all deliveries outside metropolitan France (air safety regulations).Brush and spatula come with the kit. 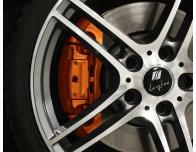 Painting kit for brake calipers orange	Complete kit to paint your 4 brake calipers (shoes or drums). Very easy to use, this kit will allow you to cover your brake calipers with ultra resistant paint (against solvents, grease, salt, etc. ), and will prevent oxidation of your brake shoes. Maintenance is facilitated because the surface will be permanently smooth, therefore holding less dirt. You will get the same sports effects that can be found on the brake shoes of high-end and sports cars. (Porsche, Subaru, Brembo, etc. )The kit consists of a cleaner spray, a paint, and a hardener. Paint will be made using a brush, to provide much thicker and stronger paint than what is usually obtained with sprays sold on the current market. In addition, the amount of paint supplied is sufficient for 2 coats (or 3 if done carefully). A documentation on how to apply it is provided. It is not necessary to remove your brake calipers.WARNING: The cleaner will be removed from package for all deliveries outside metropolitan France (air safety regulations). Painting kit for brake calipers white	Complete kit to paint your 4 brake calipers (shoes or drums). Very easy to use, this kit will allow you to cover your brake calipers with ultra resistant paint (against solvents, grease, salt, etc. ), and will prevent oxidation of your brake shoes. Maintenance is facilitated because the surface will be permanently smooth, therefore holding less dirt. You will get the same sports effects that can be found on the brake shoes of high-end and sports cars. (Porsche, Subaru, Brembo, etc. )The kit consists of a cleaner spray, a paint, and a hardener. Paint will be made using a brush, to provide much thicker and stronger paint than what is usually obtained with sprays sold on the current market. In addition, the amount of paint supplied is sufficient for 2 coats (or 3 if done carefully). A documentation on how to apply it is provided. It is not necessary to remove your brake calipers.WARNING: The cleaner will be removed from package for all deliveries outside metropolitan France (air safety regulations). Painting kit for brake calipers golden	Complete kit to paint your 4 brake calipers (shoes or drums). Very easy to use, this kit will allow you to cover your brake calipers with ultra resistant paint (against solvents, grease, salt, etc. ), and will prevent oxidation of your brake shoes. Maintenance is facilitated because the surface will be permanently smooth, therefore holding less dirt. You will get the same sports effects that can be found on the brake shoes of high-end and sports cars. (Porsche, Subaru, Brembo, etc. )The kit consists of a cleaner spray, a paint, and a hardener. Paint will be made using a brush, to provide much thicker and stronger paint than what is usually obtained with sprays sold on the current market. In addition, the amount of paint supplied is sufficient for 2 coats (or 3 if done carefully). A documentation on how to apply it is provided. It is not necessary to remove your brake calipers.WARNING: The cleaner will be removed from package for all deliveries outside metropolitan France (air safety regulations). Painting kit for brake calipers metallic pink	Complete kit to paint your 4 brake calipers (shoes or drums). Very easy to use, this kit will allow you to cover your brake calipers with ultra resistant paint (against solvents, grease, salt, etc. ), and will prevent oxidation of your brake shoes. Maintenance is facilitated because the surface will be permanently smooth, therefore holding less dirt. You will get the same sports effects that can be found on the brake shoes of high-end and sports cars. (Porsche, Subaru, Brembo, etc. )The kit consists of a cleaner spray, a paint, and a hardener. Paint will be made using a brush, to provide much thicker and stronger paint than what is usually obtained with sprays sold on the current market. In addition, the amount of paint supplied is sufficient for 2 coats (or 3 if done carefully). A documentation on how to apply it is provided. It is not necessary to remove your brake calipers.WARNING: The cleaner will be removed from package for all deliveries outside metropolitan France (air safety regulations). Painting kit for brake calipers green	Complete kit to paint your 4 brake calipers (shoes or drums). Very easy to use, this kit will allow you to cover your brake calipers with ultra resistant paint (against solvents, grease, salt, etc. ), and will prevent oxidation of your brake shoes. Maintenance is facilitated because the surface will be permanently smooth, therefore holding less dirt. You will get the same sports effects that can be found on the brake shoes of high-end and sports cars. (Porsche, Subaru, Brembo, etc. )The kit consists of a cleaner spray, a paint, and a hardener. Paint will be made using a brush, to provide much thicker and stronger paint than what is usually obtained with sprays sold on the current market. In addition, the amount of paint supplied is sufficient for 2 coats (or 3 if done carefully). A documentation on how to apply it is provided. It is not necessary to remove your brake calipers.WARNING: The cleaner will be removed from package for all deliveries outside metropolitan France (air safety regulations). Painting kit for brake calipers metallic copper	Complete kit to paint your 4 brake calipers (shoes or drums). Very easy to use, this kit will allow you to cover your brake calipers with ultra resistant paint (against solvents, grease, salt, etc. ), and will prevent oxidation of your brake shoes. Maintenance is facilitated because the surface will be permanently smooth, therefore holding less dirt. You will get the same sports effects that can be found on the brake shoes of high-end and sports cars. (Porsche, Subaru, Brembo, etc. )The kit consists of a cleaner spray, a paint, and a hardener. Paint will be made using a brush, to provide much thicker and stronger paint than what is usually obtained with sprays sold on the current market. In addition, the amount of paint supplied is sufficient for 2 coats (or 3 if done carefully). A documentation on how to apply it is provided. It is not necessary to remove your brake calipers.WARNING: The cleaner will be removed from package for all deliveries outside metropolitan France (air safety regulations). Painting kit for brake calipers carbon grey	Complete kit to paint your 4 brake calipers (shoes or drums). Very easy to use, this kit will allow you to cover your brake calipers with ultra resistant paint (against solvents, grease, salt, etc. ), and will prevent oxidation of your brake shoes. Maintenance is facilitated because the surface will be permanently smooth, therefore holding less dirt. 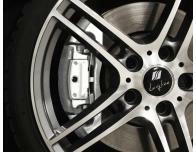 You will get the same sports effects that can be found on the brake shoes of high-end and sports cars. (Porsche, Subaru, Brembo, etc. )The kit consists of a cleaner spray, a paint, and a hardener. Paint will be made using a brush, to provide much thicker and stronger paint than what is usually obtained with sprays sold on the current market. In addition, the amount of paint supplied is sufficient for 2 coats (or 3 if done carefully). A documentation on how to apply it is provided. It is not necessary to remove your brake calipers.WARNING: The cleaner will be removed from package for all deliveries outside metropolitan France (air safety regulations). Painting kit for brake calipers matte red	Complete kit to paint your 4 brake calipers (shoes or drums). Very easy to use, this kit will allow you to cover your brake calipers with ultra resistant paint (against solvents, grease, salt, etc. ), and will prevent oxidation of your brake shoes. Maintenance is facilitated because the surface will be permanently smooth, therefore holding less dirt. You will get the same sports effects that can be found on the brake shoes of high-end and sports cars. (Porsche, Subaru, Brembo, etc. )The kit consists of a cleaner spray, a paint, and a hardener. Paint will be made using a brush, to provide much thicker and stronger paint than what is usually obtained with sprays sold on the current market. In addition, the amount of paint supplied is sufficient for 2 coats (or 3 if done carefully). A documentation on how to apply it is provided. It is not necessary to remove your brake calipers.WARNING: The cleaner will be removed from package for all deliveries outside metropolitan France (air safety regulations). Painting kit for brake calipers matte black	Complete kit to paint your 4 brake calipers (shoes or drums). Very easy to use, this kit will allow you to cover your brake calipers with ultra resistant paint (against solvents, grease, salt, etc. ), and will prevent oxidation of your brake shoes. Maintenance is facilitated because the surface will be permanently smooth, therefore holding less dirt. You will get the same sports effects that can be found on the brake shoes of high-end and sports cars. (Porsche, Subaru, Brembo, etc. )The kit consists of a cleaner spray, a paint, and a hardener. Paint will be made using a brush, to provide much thicker and stronger paint than what is usually obtained with sprays sold on the current market. In addition, the amount of paint supplied is sufficient for 2 coats (or 3 if done carefully). A documentation on how to apply it is provided. It is not necessary to remove your brake calipers.WARNING: The cleaner will be removed from package for all deliveries outside metropolitan France (air safety regulations). Lower radiator grill chrome trim	This chrome strip is only for the lower part of the radiator grill: Under the license plate.This radiator grill chrome moulding trim strip attaches to the fins of the front bumper grill of the car, in order to add a chrome finish to it. It will enhance the entire front bumper of the vehicle by highlighting it with a touch of chrome. This item can fill the entire radiator grill, and is not limited to a single strip.Warning: this is a roll of Universal chrome strip to be cut/adjusted by yourself. The product is specially designed so it can be trimmed very easily, which gives a perfect and specific finish to your vehicle. You can cut the strips using a pair of scissors (mounting is not difficult, and does not require knowledge/special tools).The back of the chrome strip is covered with a 3M double-sided tape (premium adhesive, long lasting and sticks on all surfaces). Is resistant to rain/snow, UV and washing (indirect high pressure jet and rollers).Make sure you degrease the surface with a Gasoline type F solvent before applying it. 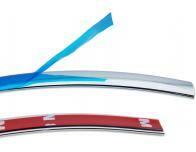 2 aluminium Luxyline door sills	This door sill of the brand Luxyline is made of aluminium. The logo is embossed with a brushed aluminum effect. The back of the door sill is covered with a double-sided adhesive of the brand 3M, which allow it to be permanently fixed on all surfaces.CAUTION: please check that the size of the door sill matches the one of your car. 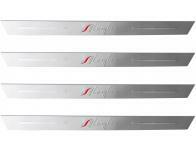 4 aluminium Luxyline door sills	This door sill of the brand Luxyline is made of aluminium. The logo is embossed with a brushed aluminum effect. The back of the door sill is covered with a double-sided adhesive of the brand 3M, which allow it to be permanently fixed on all surfaces.CAUTION: please check that the size of the door sill matches the one of your car. Side windows chrome trim 9mm x 10m	This chrome window strip fits on the edges of the side windows of the car, to add chrome finish. It will enhance the length of the vehicle by highlighting it with a touch of chrome.Warning: this is a roll of Universal chrome strip to be cut/adjusted by yourself. The product is specially designed so it can be trimmed very easily, which gives a perfect and specific finish to your vehicle. You can cut the strips using a pair of scissors (mounting is not difficult, and does not require knowledge/special tools).The back of the chrome strip is covered with a 3M double-sided tape (premium adhesive, long lasting and sticks on all surfaces). Is resistant to rain/snow, UV and washing (indirect high pressure jet and rollers).Make sure you degrease the surface with a Gasoline type F solvent before applying it. Side windows chrome trim 12mm x 10m	This chrome window strip fits on the edges of the side windows of the car, to add chrome finish. It will enhance the length of the vehicle by highlighting it with a touch of chrome.Warning: this is a roll of Universal chrome strip to be cut/adjusted by yourself. The product is specially designed so it can be trimmed very easily, which gives a perfect and specific finish to your vehicle. You can cut the strips using a pair of scissors (mounting is not difficult, and does not require knowledge/special tools).The back of the chrome strip is covered with a 3M double-sided tape (premium adhesive, long lasting and sticks on all surfaces). Is resistant to rain/snow, UV and washing (indirect high pressure jet and rollers).Make sure you degrease the surface with a Gasoline type F solvent before applying it. Side windows chrome trim 15mm x 10m	This chrome window strip fits on the edges of the side windows of the car, to add chrome finish. It will enhance the length of the vehicle by highlighting it with a touch of chrome.Warning: this is a roll of Universal chrome strip to be cut/adjusted by yourself. The product is specially designed so it can be trimmed very easily, which gives a perfect and specific finish to your vehicle. You can cut the strips using a pair of scissors (mounting is not difficult, and does not require knowledge/special tools).The back of the chrome strip is covered with a 3M double-sided tape (premium adhesive, long lasting and sticks on all surfaces). Is resistant to rain/snow, UV and washing (indirect high pressure jet and rollers).Make sure you degrease the surface with a Gasoline type F solvent before applying it. Side windows chrome trim 9mm x 12m	This chrome window strip fits on the edges of the side windows of the car, to add chrome finish. It will enhance the length of the vehicle by highlighting it with a touch of chrome.Warning: this is a roll of Universal chrome strip to be cut/adjusted by yourself. The product is specially designed so it can be trimmed very easily, which gives a perfect and specific finish to your vehicle. You can cut the strips using a pair of scissors (mounting is not difficult, and does not require knowledge/special tools).The back of the chrome strip is covered with a 3M double-sided tape (premium adhesive, long lasting and sticks on all surfaces). Is resistant to rain/snow, UV and washing (indirect high pressure jet and rollers).Make sure you degrease the surface with a Gasoline type F solvent before applying it. Side windows chrome trim 21mm x 10m	This chrome window strip fits on the edges of the side windows of the car, to add chrome finish. It will enhance the length of the vehicle by highlighting it with a touch of chrome.Warning: this is a roll of Universal chrome strip to be cut/adjusted by yourself. The product is specially designed so it can be trimmed very easily, which gives a perfect and specific finish to your vehicle. You can cut the strips using a pair of scissors (mounting is not difficult, and does not require knowledge/special tools).The back of the chrome strip is covered with a 3M double-sided tape (premium adhesive, long lasting and sticks on all surfaces). Is resistant to rain/snow, UV and washing (indirect high pressure jet and rollers).Make sure you degrease the surface with a Gasoline type F solvent before applying it. Side windows chrome trim 12mm x 12m	This chrome window strip fits on the edges of the side windows of the car, to add chrome finish. It will enhance the length of the vehicle by highlighting it with a touch of chrome.Warning: this is a roll of Universal chrome strip to be cut/adjusted by yourself. The product is specially designed so it can be trimmed very easily, which gives a perfect and specific finish to your vehicle. You can cut the strips using a pair of scissors (mounting is not difficult, and does not require knowledge/special tools).The back of the chrome strip is covered with a 3M double-sided tape (premium adhesive, long lasting and sticks on all surfaces). Is resistant to rain/snow, UV and washing (indirect high pressure jet and rollers).Make sure you degrease the surface with a Gasoline type F solvent before applying it. Side windows chrome trim 15mm x 12m	This chrome window strip fits on the edges of the side windows of the car, to add chrome finish. It will enhance the length of the vehicle by highlighting it with a touch of chrome.Warning: this is a roll of Universal chrome strip to be cut/adjusted by yourself. The product is specially designed so it can be trimmed very easily, which gives a perfect and specific finish to your vehicle. You can cut the strips using a pair of scissors (mounting is not difficult, and does not require knowledge/special tools).The back of the chrome strip is covered with a 3M double-sided tape (premium adhesive, long lasting and sticks on all surfaces). Is resistant to rain/snow, UV and washing (indirect high pressure jet and rollers).Make sure you degrease the surface with a Gasoline type F solvent before applying it. Side windows chrome trim 21mm x 12m	This chrome window strip fits on the edges of the side windows of the car, to add chrome finish. It will enhance the length of the vehicle by highlighting it with a touch of chrome.Warning: this is a roll of Universal chrome strip to be cut/adjusted by yourself. The product is specially designed so it can be trimmed very easily, which gives a perfect and specific finish to your vehicle. You can cut the strips using a pair of scissors (mounting is not difficult, and does not require knowledge/special tools).The back of the chrome strip is covered with a 3M double-sided tape (premium adhesive, long lasting and sticks on all surfaces). Is resistant to rain/snow, UV and washing (indirect high pressure jet and rollers).Make sure you degrease the surface with a Gasoline type F solvent before applying it.